It is widely demonstrated that farmed fish, prawn and shrimp are more susceptible to disease agents than their wild counterparts due to the artificial conditions posed by intensive rearing. The immune system of aquatic organisms, such as fish, prawn and shrimp is continuously affected by periodic or unexpected changes of their environment. Adverse environmental situations may acutely or chronically stress the fish, prawn and shrimp altering some of their biochemical parameters and suppressing their innate and adaptive immune responses. Nonspecific defense mechanisms play an important role at all stages of infection. Fish, prawn and shrimp particularly, depend more heavily on these non-specific mechanisms than do mammals. Hence, there has been increasing interest in the modulation of the non-specific immune system of fish, prawn and shrimp as both a treatment and prophylactic measure against disease. When infectious outbreaks appear they may be fought by means of chemotherapeutants, vaccines or immunostimulants. More recently, the administration of probiotics to fish, prawn and shrimp through the diet and to the pond has appeared as a very promising control measure in fish, prawn and shrimp farms. 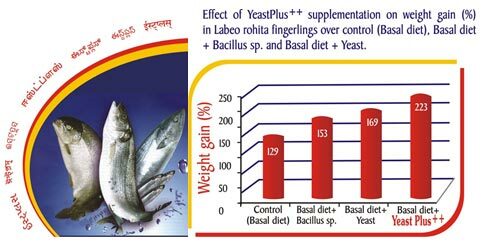 YeastPlus++ is a novel probiotic formulation of Yeast and Bacillus sp. to provide improved performance of commercially important aquaculture species in aquaculture ponds. YeastPlus++ formulation providing Saccharomyces cerevisiae and Bacillus sp. is well designed for maintenance and balanced growth rate of Shrimp, Prawn and Fish. YeastPlus++ has potential benefits to improve the non-specific immune response which reflected on the stimulation of macrophage cells and increasing their phagocytic activity. YeastPlus++ could provide healthy and safe fish production from aquaculture replacing antibiotics for both fish and fish consumers. Reduced duration of the cycle to achieve target weight. Increased average weight and corresponding market value. Ability to adhere to and colonize the gut. To antagonize with other organisms notably putative pathogens. Improved pond conditions with good plankton and beneficial bacterial density. 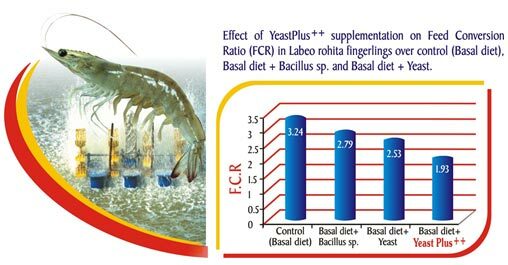 YeastPlus++ is a mixture of dense probiotic formulationof Saccharomyces cerevisiae and Bacillus sp. Pond application: 1-2 kg / acre.